Recently, Facebook has been forced to admit that it made a mistake when it penalised the Babylon Bee for distributing fake news. 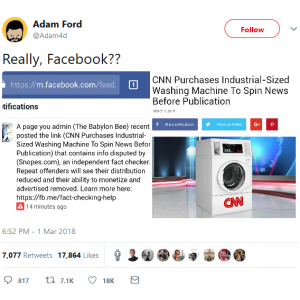 A spoof article from the popular satirical Christian website was fact checked at Facebook’s request by David Mikkelson, the founder of Snopes.com. When Mikkelson flagged it as containing false facts, the Babylon Bee received an official warning from Facebook, restricting the page’s distribution and potentially threatening the creator’s livelihood. Not, I would have thought, the Babylon Bee’s best work. There is lots we could say about the incident – about fake news, the leftist bias of big tech, or about the impossible task of one American company deciding what is true and what is false for each of its 2.2 billion monthly active humans. But I want to talk about something far more important: literary genres. The mistake that independent fact checker David Mikkelson made – and let’s not blame him, he is a computer science graduate, after all* – was a textbook literary fail. By attempting to ‘fact check’ a satirical work, and then by flagging those facts as ‘false’ (a status which the article still has on snopes.com), he has committed the unforgivable hermeneutical sin of misusing genre. He has taken a category which is appropriate to the genre of a news article (fact or error) and misapplied it to a different genre (satirical news spoof). To call satire ‘false’ is a category error – like assessing the grammar of an oil painting, or the character development of a chocolate cake. That is not to say that satire is exempt from any critical judgments – there are values and potential truth claims in the spoof article which could be evaluated. Satire can’t be false, but it can be bad (by missing the mark, or being unfair). Someone, certainly, thought the satire was bad: the article was presumably flagged for checking because a user, perhaps unamused, or unsympathetic to the Babylon Bee’s conservative Christian bias, reported the article to Facebook. Is CNN biased in its new coverage? Is the Babylon Bee article on the money? Is it lame? Or too snarky? These are valid questions. But they are not something that can be ‘fact checked’ in an ‘independent’ or value neutral way by a computer scientist in 83 words with a single supporting reference (a single supporting reference which turns out, by the way, to be no more than a footnote back to the original article). It’s like deciding that a political cartoon is false because the nose is drawn too big. Genres supply a constantly evolving but relatively stable set of tools and conventions for authors and readers to draw on to create meaning. Everything you pick up and read – be it a novel or a scientific paper or a business card – makes use of the conventions and worldview that genre supplies. This is not less true, but especially true when you pick up and read a biblical text. Unlike a scientific paper or a business card, the Bible is a literary text, which means applying genre is not straightforward. God’s revelation about himself is communicated in a way that suits is subject matter: with overwhelming grandeur, striking creativity and dizzying intertextuality. Misusing genre is no way to treat any book … let alone the Book of Books. As an evangelical I am convinced that it is true; but also as an evangelical I am committed to receiving the Bible on its own terms, not holding on to my preconceptions about the way that truth must be communicated. Therefore I need to listen carefully to the text in its context to form a picture of its genre. Read the Babylon Bee and it helps to know that it’s satire. Read Genesis 6—9 and it helps to know that the Noah story is a point by point rebuttal of a Sumerian flood epic. Read Joshua and the conquest narratives and it helps to know that the genre makes frequent use of hyperbole to describe military victories. The good news is, though, you don’t need to have a degree in ancient literature to be sensitive to genre. You can start by just keeping an ear out, and by being prepared to revise your prejudices. When we start reading a book of the Bible, we are already taking a punt about what kind of book it is, including its genre. That’s fine. In fact, it’s necessary – genre is one of what Hans-Georg Gadamer calls the ‘enabling prejudices’ which make reading possible. We just have to make sure we are also open to revising those expectations when we meet something that doesn’t quite fit. It may not be false; it may just be doing something we weren’t expecting. * Sorry, cheap shot. I’m sure there are several computer science graduates who are also literate. Andy Judd is an associate lecturer in Old Testament at Ridley College in Melbourne. Could we build a Snopes-style commentary for apocalyptic biblical literature, pitting literalistic misreadings against a genre- and context-sensitive understanding. Claim: A horn with eyes and mouth, mounted on an animal with iron teeth and bronze claws and seven other horns, has started a war against God’s people. Yes you’re right about that – Snopes definitely understood that the article was satire. However, the way that analysis is integrated automatically into Facebook with a simple “True” or “False” decision leaves little room for different types of true.